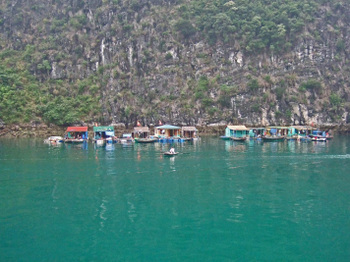 Pho Cuong(Hanoi) and Halong Bay - mmm-yoso!!! 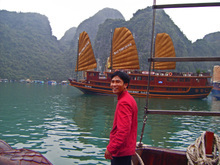 During our trip to the Handicraft Villages around Hanoi, we spoke to our guide Mr Hung, regarding food in Hanoi. 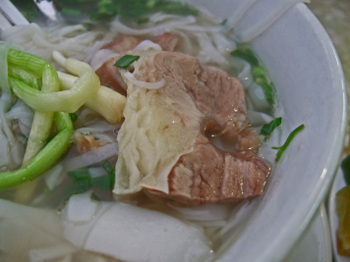 Among the places recommended, was a place for Pho, Pho Cuong. We mentioned that we hadn't enjoyed our previous encounter....but Hung assured us that this place was "the best", and very close to our hotel. As with all the recommendations we received, whether by people we knew, or by people we met in Vietnam, this rec' was seconded, this time by one of the staff at the hotel. I was still not sure if I was ready for another bowl of Pho, but we went to the alley right in front of Dong Xuan Market, and found the Bun Rieu booths weren't ready yet...so I thought what the heck. And ended up just up the street from Pho Thin. As we arrived, we realized that we had walked past this place yesterday, and I had remarked about how busy the place was.... The Missus, walked right up to the cooking area; fascinated at how quick the whole process was. The photo on the right is one of the Missus's favorites; She always cracks up when She sees it....."You could place that Guy in any Pho place in San Diego. He has the universal Pho gear....white shirt, pad, with pencil at the ready. We should take photos as all the places we go to, and do a line-up, and see if people can figure out which one was taken in Vietnam!" Meanwhile, the Missus was checking out the entire process. 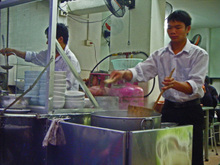 You gotta give it to these guys....they didn't even blink when the Missus walked over and watched them make my Pho Bo Tai Chin. 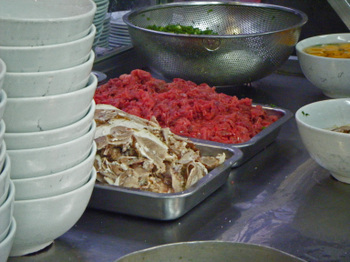 Then the meat....rare beef, and fatty beef(like brisket), is given a dunk. All covered by the broth, scallions, and a sprinkling of pepper. 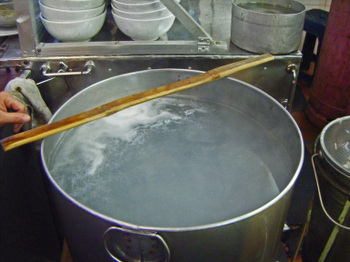 Meanwhile, even though your Pho is ready in a flash....your check hits the table even faster! 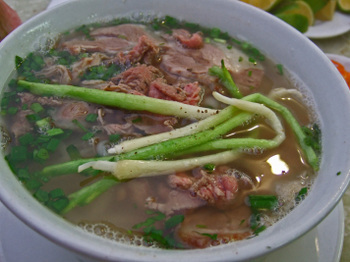 After finishing my bowl(16,000 VND - $1), I told the Missus; "ok, no more Pho, no matter who recommends it......"
When we got home, I found a post by Stickyrice on Pho Cuong, which can be found here. 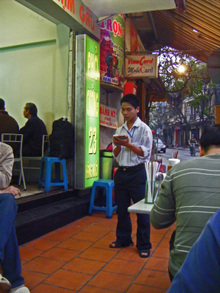 The Missus waited to eat(other than the Banh Gio we had earlier) until we returned to the hotel. 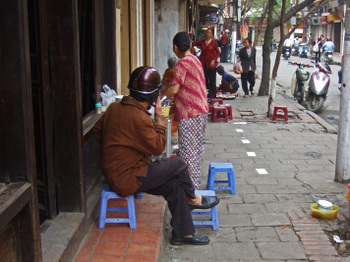 Right outside the Hanoi Elegance 2, on Ma May Street were a group of street vendors. 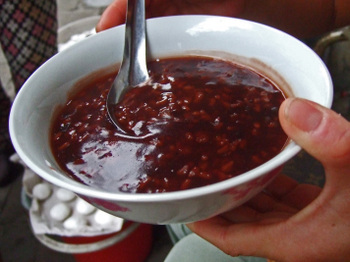 One of whom sold this....red bean porridge. 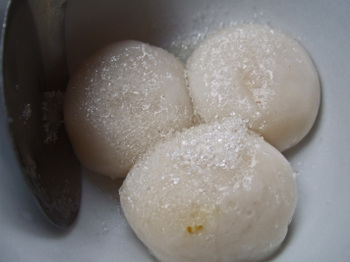 Which the Missus couldn't wait to get Her hands on.......it brought back many childhood memories.....and She even waited around until the woman finished making the Glutinous Rice Dumplings with Mung Bean Filling. She grew up eating these in China....brought back nice memories for Her. We also, met a nice young lady who worked across the street, and had a delightful conversation. 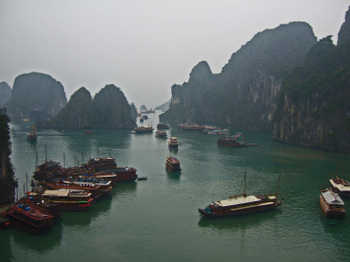 She practiced English, and asked many questions, and we got to ask about life in Hanoi. After the 3 1/2 hour trip, we entered a crowded parking lot......hundreds of people milling around. 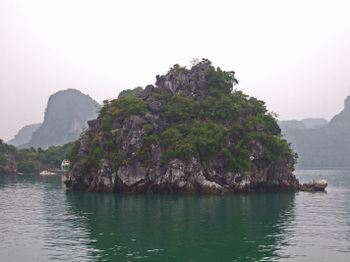 But Halong Bay is lovely! It was overcast, but that just added to the sense of mystery. 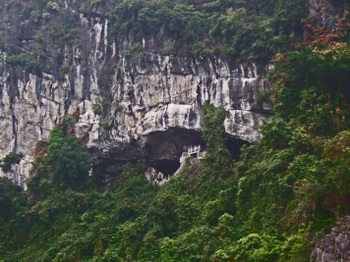 One of our favorite parts was the walk to Hang Sung Sot(aka "The Amazing Cave"). We enjoyed the walk through the cave, and our Guide Lan, was amazingly kind, and very patient, especially with a very demanding, rude, and borderline bi-polar visitor....who would be making demands and being very rude one minute...and a second later would be sweet and nice! One of the features of this cave, which is comprised of 2 huge chambers is the "phallic rock"...which is illuminated by pink lighting! 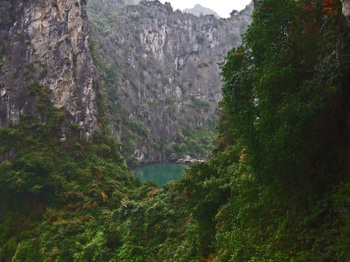 The view from the cave is simply beautiful......it's where the first photo was taken. Also, off to the right is a view of an enclosed lake. This merchandising lady was very resourceful. She was on one end of dock when we arrived....and moved to the other end as we left. 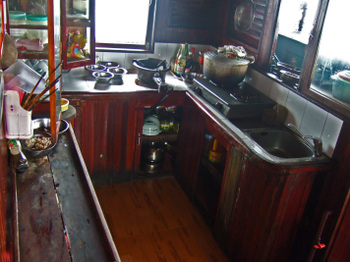 And even though it was near the engine room, and the kitchen, that wasn't an issue, because we were up early anyway. Lan was an excellent guide......She had spent time in China, and was fluent in Mandarin, and had a blast chatting with the Missus. 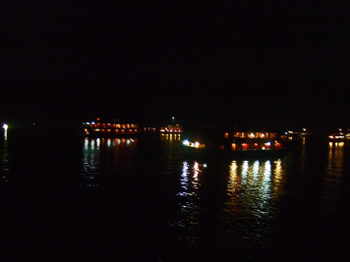 Everyone anchors in the same spot for the evening, and it almost seems like a city on the water. Thank God for jet lag......we got up at 430 am, and managed to have a few moments of peace. No sunrise because of the overcast skies, but we'll take the wonderful solitude....most everyone else had been up late, except us. 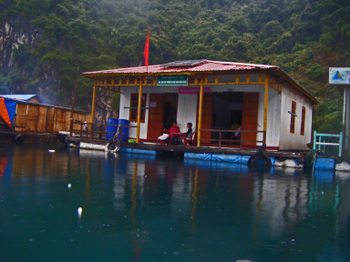 The following morning we moored at one of the floating villages. As mentioned by Sharon in Her Blog, the variety of items being sold (Pringles anyone?) is quite amazing. Kayaking around the village and bays was enjoyable. The Missus was proud of Her "kayaking classes", "aren't you glad I took kayaking classes? NOW ROW...."
We also got to know a couple from Minnesota, currently living in Singapore, visiting with their son, who was impressively well mannered and behaved. Thanks to them(thanks Tomi!) we got a lead for a driver in Siem Reap. 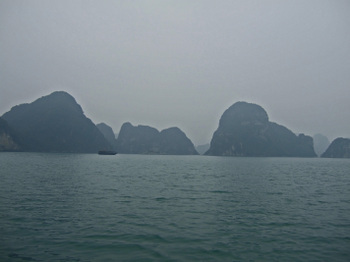 Someone did email me, asking if Halong Bay is worth it....I'd say without a doubt, yes! Perhaps just once.....the Missus and I thought that things were a bit crowded(many, many boats), lots of fumes, and when you actually get close to the water you notice the amount of oil...and plastic bags/bottles in the water. I'm hoping this is eventually addressed, because it is a treasure. 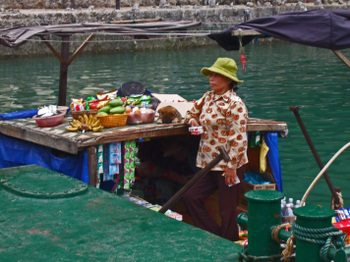 The crew of the Santa Maria were very nice, and the price of $97/each is very reasonable. 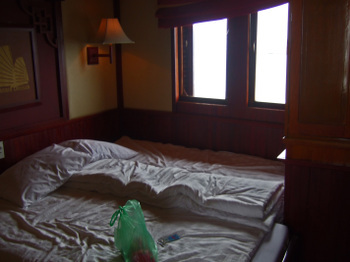 There are only 8 cabins on the Junk, so you are able to carve out your personal space. Interesting post. 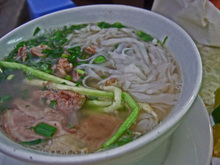 I had heard from a friend that pho in Viet Nam is different from the pho we get here in the states. It might have to do with the quality of the ingredients (i.e. beef, water, etc. 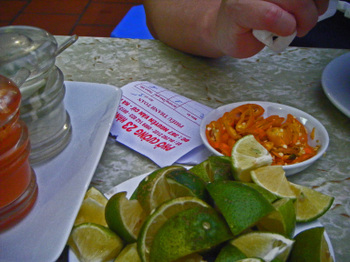 ), but then a lot of times, the flavors are developed for "the locals". 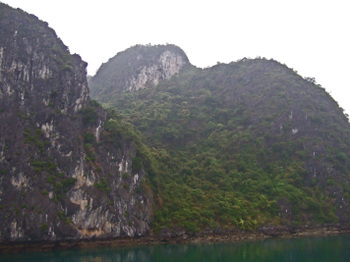 Halong Bay looks so picturesque. I am waiting for they day when I get to visit. 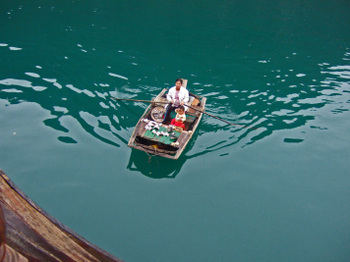 WOW your blog is better than watching a travel show! It has a food and a sights section ! 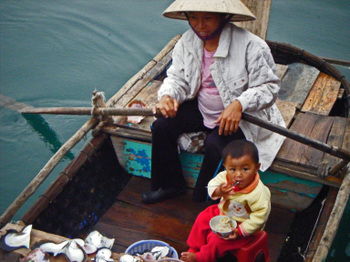 Thanks for capturing the sights and tastes of vietnam for us in such a candid way. The inside was surprisingly comfortable looking and I wish we could have had a look at some of the food :) But you got the most important part anyway, the scenery. Wow. Great pics again. Love it! Nice. 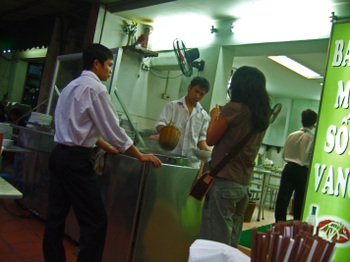 I've always been curious how they get the pho out to you so fast. I've been tempted to sneap a peek behind the curtains from time to time. 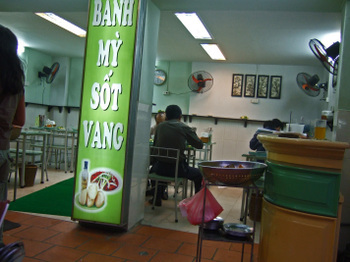 I prefer the pho in the US, but Pho Bat Dan at 49 Bat Dan St., Ha Noi is pretty good. There a line in front of the place all day and you must be assertive to get to the front of the line. It may not be worth it. 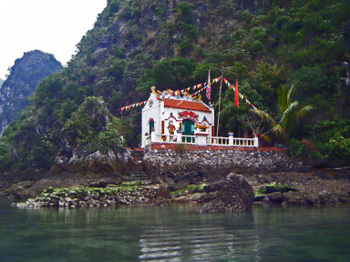 I love your blog and your travel to Vietnam makes it even more wonderful. Fascinating! I'd love to know more about the floating villages ... I find myself wondering if they're populated by families that have lived there for generations, what their culture is like, stuff like that. 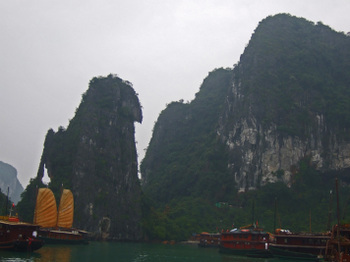 I did read up a little on Halong Bay--looks like it's collected lots of history and legends. It was so funny reading your comments on Pho. Is the Bun Rieu coming soon? =) Red bean porridge and w/ salty pickle is a classic. Hi Reid - The Pho that we're used to having in the States is "Southern" Pho - like they have in HMC. Northern Pho is quite different. Hi Rachel - The food was really nothing that interesting....but the sights were often very beautiful! Hi Ed - I'm glad you're enjoying it....you need to get on over there some day. Hi Loan - I wish I'd had your rec' earlier! I'm glad you enjoy our little blog, and thanks so much for commenting! 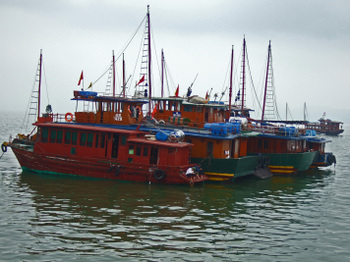 Hi Mizducky - We visited 2 floating villages while on the trip; Halong Bay was definitely more well to do than the other one we visited....it was a humbling experience. 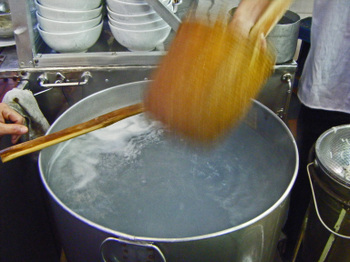 Hi YY - Yes, Bun Rieu coming soon....I'm kinda doing things in chronological order, so thanks for hanging in there. 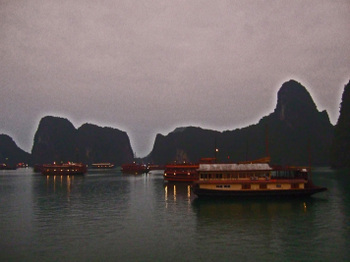 that photo of Ha Long Bay is a classic in itself. Umm, what's that about a "podcast," on bottom of your sidebar? 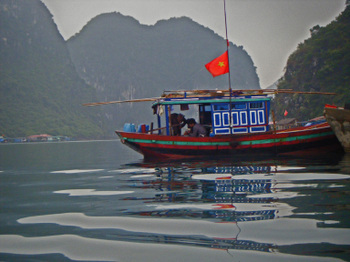 Hi RONW - It's for Odiogo, an automated podcast thingy....I just wanted to hear what our posts sound like translated....bad thing is, they pronounce Pho as "Foe".....bummer. Hi Kirk, thanks for the link! We also went on the Santa Maria cruiser. We had the greatest tour guides with us...wonder if we had the same? 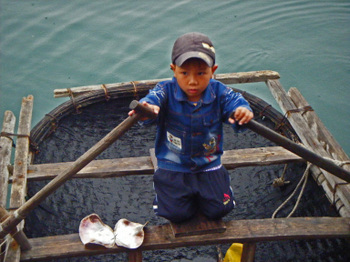 We laughed as after awhile, we'd call our boat meals "seafood surprise." I'm quite jealous of the glutinous rice dumplings as I must have missed those. Great pictures! Hi Sharon - Our guide was named Lan; she was wonderful! Seafood surprise......I love it! Hi Billy - We finally felt adjusted on our last day in Phnom Penh....just in time to return home. Hi FH - I think you hit the nail on the head....as beautiful and amazing everything was; it's the people that we talk about the most.